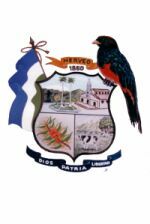 According to <herveo-tolima.gov.co>, the flag of Herveo is combined from three equal horizontal stripes of blue-white green. The superior blue stripe is a in clear (light?) blue and symbolize the sky and the rivers that stream in our region. The middle white stripe symbolize virtue, hope and peace. The bottom green stripe symbolize the fertility of the fields, prairies and mountains that surround the city.